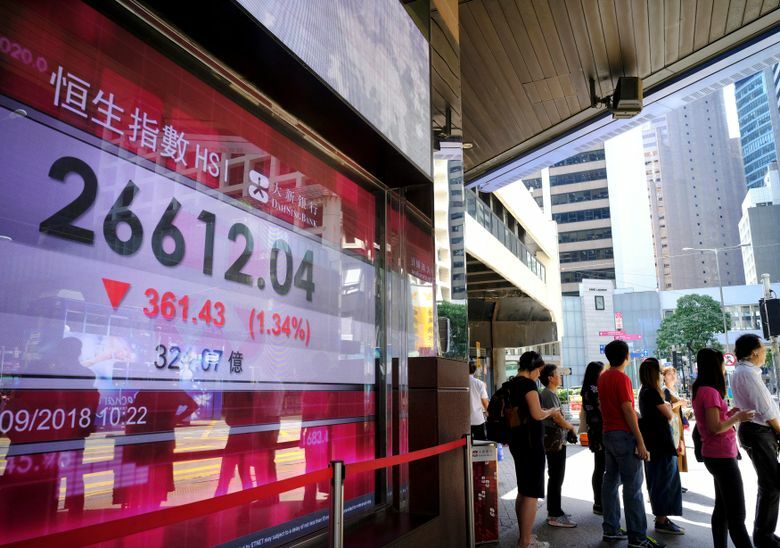 SINGAPORE (AP) — Asian shares were mostly lower on Monday after U.S. President Donald Trump declared he was considering tariffs on an additional $267 billion in Chinese goods, ratcheting up tensions between the world’s two biggest economies. It overshadowed a strong U.S. jobs report that kept the Fed on track to raise interest rates. KEEPING SCORE: Japan’s benchmark Nikkei 225 climbed 0.3 percent to 22,370.01 after the country’s gross domestic product surpassed expectations by growing at a 3.0 percent annual rate in the April-June quarter. The Kospi in South Korea gained 0.3 percent to 2,288.51. 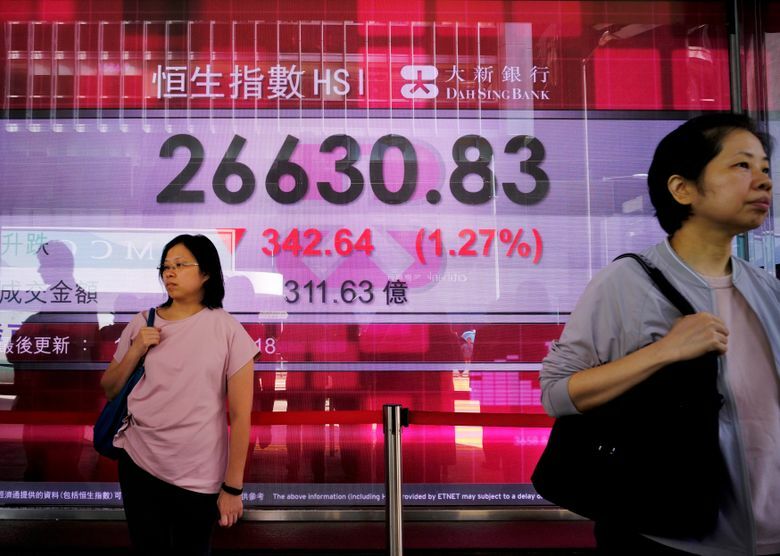 But Hong Kong’s Hang Seng index tumbled 0.9 percent to 26,736.22. 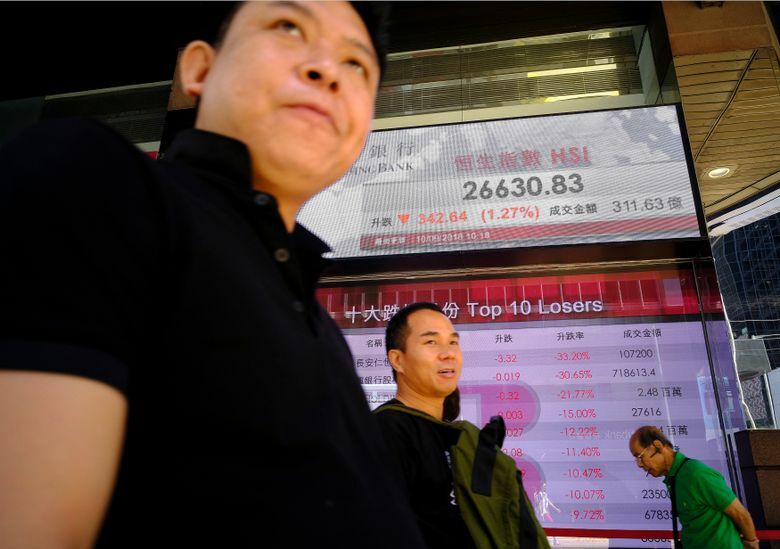 The Shanghai Composite index fell 0.6 percent to 2,685.30. Australia’s S&P/ASX 200 was flat at 6,144.90. WALL STREET: U.S. stock indexes fell on Friday after President Donald Trump said he’s ready to impose tariffs on essentially every good that’s imported from China. The S&P 500 index fell 0.2 percent to 2,871.68, ending the day with its fourth straight loss. The Dow Jones industrial average shed 0.3 percent to 25,916.54. The Nasdaq composite was 0.3 percent lower at 7,902.54. US-CHINA TRADE: Trump told reporters on Air Force One that the potential tariffs were “ready to go on short notice if I want”. Such a step would significantly escalate his trade war with Beijing and would likely increase costs for a broad range of U.S. businesses and consumers. The Trump administration is already poised to slap tariffs on $200 billion worth of goods from China, such as handbags and bicycle tires The U.S. has already imposed tariffs on $50 billion in Chinese imports, for which Beijing has retaliated with an equal amount of import taxes on U.S. goods. STRONG JOBS REPORT: The pace of hiring in the U.S. quickened in August and wages grew at their fastest pace in nine years. The economy added a strong 201,000 jobs and the unemployment rate stayed at 3.9 percent, near an 18-year low, the government said Friday in its monthly jobs report. The data points to a job market that remains resilient after nearly a decade of economic growth, and even with tariffs and counter-tariffs on imports and exports looming over U.S. employers that rely on global trade. ANALYST’S TAKE: “Dark clouds continue to gather on markets with the latest threats regarding further tariffs on Chinese goods dominating sentiment, making for a weak start to the week,” Jingyi Pan of IG said in a commentary. “With any updates detailing the implementation based on President Donald Trump’s suggestion, that would most certainly be negative for equity markets, one to watch in the week,” she said. ENERGY: Benchmark U.S. crude added 45 cents to $68.20 a barrel. The contract lost 2 cents to settle at $67.75 per barrel in New York. Brent crude, used to price international oils, gained 49 cents to $77.32 a barrel. It rose 33 cents to $76.83 a barrel in London on Friday. CURRENCIES: The dollar fell to 110.96 yen from 111.06 yen. The euro eased to $1.1544 from $1.1566.